There’s nothing more frustrating than pouring time and money on an app only to discover that it’s simply not usable. 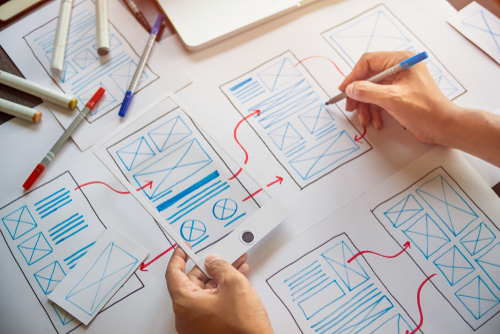 Failing miserably in the UX/UI department is, unfortunately, something that happens too often, even to the most careful and attentive entrepreneurs. Before even addressing the issue at hand, we should ask ourselves what makes an app “good” or “usable”. Basically, a user will choose to use an app if 3 things apply – the user understands how to use the app, the app is personalized and doesn’t require identification on every single use, and the app is efficient, meaning, it does what the user needs it to do. People like to know what happens next. It’s only human. We don’t enjoy uncertainty and we don’t enjoy waiting. The combination of both can be a kiss of death for your app. If your app has any actions that include waiting of some sort like loading pages, submitting forms, etc., you should provide an indication using a progress bar or animation so they’re not left in the dark. This is a UX basic, but still worth mentioning. The text on your app needs to be pretty and unique, but not at the expense of your users. So make sure not to use strange fonts that are unreadable on mobile devices and keep the contrast between the text and the background in mind. We understand that there’s a tension between the amount of information that your app needs to display and the amount of ‘real state’ you have to display it on (i.e., the screen), especially when in some cases you need to make room for things like banners and ads. However, when it comes to usability and UX – less is more. Cognitive overload, especially in the pages that welcome users into your application may very well drive users off. It’s a delicate balance and you need to be careful with it. There are times where less is more. When it comes to feedback, this rule DOES NOT apply. Users need feedback on their actions and an app that doesn’t provide feedback is most likely an app that will not retain users. People need to know what’s going on and if the action they just did actually worked or not. Use error messages, confirmations and progress feedback to communicate with users and understand that the relationship between the user and the app is a dialogue and not a monologue. This is perhaps the most important insight of them all – good User Experience is all about putting the users in the center. Your design should be focused not on what you like or think is best, but rather on what your users need and what can answer their needs best. Take the time to research and get to know your target audience and even make them part of your design process. Both you and they will benefit from it. Looking for a user-friendly app solution for your business? Learn more about bobile’s business app creator.